Donate clothes, toys - givekidsadreams Webseite! During the visits in Nobember 2017, GiKaD discovered that the children often have only two pieces of clothing: a uniform for the school and one, often worn, to wear at home. Mrs. Ninh Hong has volunteered to take care of used clothing - for adults too, because not only the children, but their parents are also happy about every donated clothing - as well as used toys. She will wash and iron them. Toys will be sorted into categories (age group, girls, boys, etc.). All will be wrapped against dust and distributed at the next visit to the needy. The idea is great, the realization a bit more complicated. Since Vietnam does not permit the import or the shipping of old clothes and used toys, they can only be carried as baggage when travelling to Vietnam. 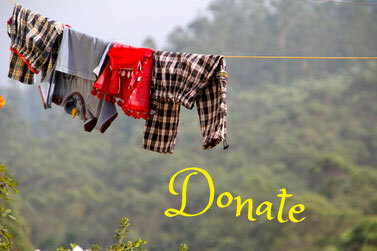 If you visit Saigon and want to donate clothes or toys, please contact us (see Email us).